Description: Early 1960s. Approximately 25w, two channels (normal and vibrato) each with volume, contour, treble and bass, and speed and intensity on the vibrato channel. 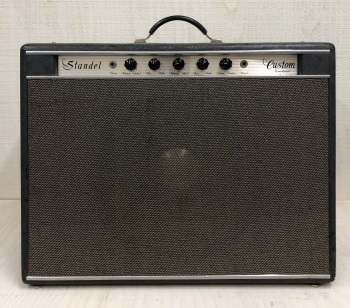 Interesting transitional hybrid with solid state pre-amp and tube power section. JBL D-130 15" speaker. Unique, rare amplifier with robust cleans.